If I were to ask everyone I knew to raise their hand if they’d ever owned a Troll, then I imagine that I’d be seeing a hell of a lot of hands. I had mine passed down to me from my Mum, and wherever I went there always seemed to be at least one lurking around. It seems they’re still popular after all these years, as ‘Trolls’ is the newest kids film to grace our screens. The trolls are a happy, sparkly bunch of, well… trolls, who lived in a happy, sparkly tree until the evil Bergens (evil monsters that weirdly look very similar to actual trolls) start to eat them every year for Trollstice, under the belief that they only way to achieve brief happiness is by shoving trolls down your throat. Thankfully the trolls manage to escape before they are eaten by King Gristle, who is yet to experience such troll-y goodness, and find a new home hidden well away from any potential threats. Twenty years later and the trolls are all happy again – they’re safe from the Bergens and can now dance and sing and hug all day long. Princess Poppy (Anna Kendrick) is insistent on throwing the party to shadow all parties ever, but Branch (Justin Timberlake), a slightly different troll who doesn’t enjoy parties or singing, warns against it in case the Bergens notice. Of course Poppy doesn’t listen so Branch just retires back to his super-prepared Bergen-repelling underground bunker. As I’m sure you can all guess Branch is right, and so ends up going on a quest with Poppy to rescue her friends after they are captured by the Bergens for the re-initiation of the Trollstice ceremony. I’ll start with the good bits – the textures in this animation are some of the best I’ve seen, with some seriously realistic fluffiness and felt going on. It’s an incredibly colourful and energetic film, feeling a bit like a sugar rush, but it’s just what makes a film appealing to a lot of kids. The monsters were my favourite part of the film, who utilise their multi-coloured environment to hide away and surprise their prey. I also thought the musical element was great (which is a surprise, since musicals are usually something I despise passionately). The soundtrack is particularly eclectic, ranging from Justice to Adele and even Simon and Garfunkel at one point. The singing isn’t overdone, either – Timberlake and Kendrick sing well together but it’s not the main focus, which can only be a good thing. The problem, sadly, boiled down to the plot. Mainly because it wasn’t an original plot at all – it’s as if they grabbed every kids’ film they could think of, smashed them together, and then just added a load of glitter. There’s so many clichés and tropes that it all becomes a bit dull – good for if your child hasn’t had much exposure to films, but if they watch quite a lot then they are unlikely to find it engaging. The other problem was the whole moral of the story – I think what they were trying to get across was that anyone can be happy, and that’s all well and good. The way they put it across made it look like we have to be like that all the time – all of the characters are highly sociable, live for the moment extroverts apart from Branch and, coincidentally, he’s the one that gets shunned. Thankfully the whole “you’re a loser if you don’t do all this colourful and lively stuff” concept dissipates halfway as the trolls become more accepting of him, but it doesn’t disappear entirely. The end results in Branch suddenly enjoying singing and dancing (his pet hate from the very start) and becoming a bright blue, rather than his original grey, and I couldn’t help but feel betrayed that the only character I identified with had to completely change himself in order to be liked. 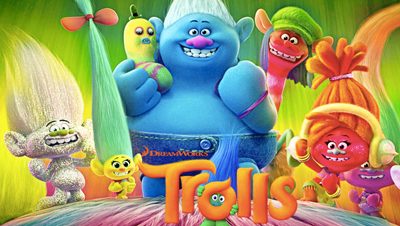 ‘Trolls’ is a film that has a lot of enjoyment in it for kids, but more for the sensory impact than an entertaining story. It’s fun and well-animated if your kids like songs and bright colours, but if you’re looking for something with actual substance then I’d check out ‘Storks’ and ‘Moana’ instead.